Swamp forest ecosystem called ‘alaka’ by the Urarina people of Nueva Union; probably equivalent to ‘aguajal’ in Spanish. 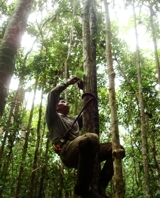 In recent years, researchers at the University of St Andrews, their colleagues at the Peruvian Amazon Research Institute (IIAP), and others have highlighted the crucial role that the Amazon’s largest tropical peatlands, located in the Loreto Department of Peru, play for the global climate due to their role as a carbon store and sink. But what about the people who inhabit these spaces? Are they aware of the existence of the peat below their feet? Does it matter to them? Do they see any threats for peatland conservation? The collaborative project “Valuing intact tropical peatlands” (St Andrews-IIAP) aims to look at these questions for the first time, in a pilot social science research project on tropical peatlands in Peru. 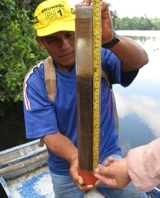 The peatlands in question are located to the southeast of the Amazonian city of Iquitos, and span territory inhabited by native communities and more recent mestizo settlers. One indigenous group inhabiting spaces near peatlands are the Urarina. The Urarina have their own language, culture, governance, and customs and maintain a relatively independent lifestyle, based on subsistence agriculture, hunting and fishing. They have been living near peatlands for hundreds, if not thousands of years. Our social science research team, consisting of Christopher Schulz (School of Geography and Sustainable Development – University of St Andrews), Manuel Martín, Cecilia Núñez, and Margarita del Águila (Sociodiversity Programme – IIAP) visited an Urarina community near the Chambira River for 10 days at the beginning of April. Despite some language barriers, we were well received by the inhabitants of Nueva Unión, with whom we carried out participatory mapping exercises, interviews, and site visits to the peatlands surrounding their community. 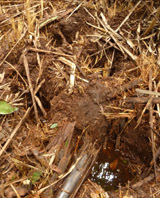 One of the most important uses of peatlands for the Urarina are the fruits and fibres of aguaje palm trees that grow in swampy, probably peaty, areas. The women are skilled in spinning threads from aguaje fibre, which they then weave over months to produce the cachihuango, a traditional textile product among indigenous communities of the Amazon. The men frequently visit peatlands during extended hunting trips, not least because Nueva Unión is surrounded by peatlands in almost every direction; they have to be careful not to be trapped by the baainu, the evil spirit that inhabits peatlands and may make them lose their way home. 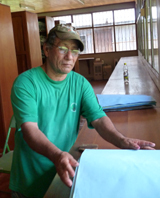 We left Nueva Unión with a positive outlook on the future of the community, and of the surrounding peatlands. Without exception people, including the young, reported being happy and satisfied with their lives in the community and planned on staying there. They did not report any major threats to peatlands, although conventional development is encroaching the area in the form of oil exploration activities and the timber trade. Nevertheless, we were also left wondering how life in Nueva Unión may change in the future, once mobile phone reception, internet, and television reach this outpost in the Peruvian Amazon, and may create a desire for change. Freddie is returning to Peru for the second spell of fieldwork for his PhD project on the historical ecology of Peruvian peatlands. 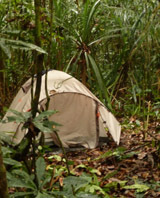 Greta Dargie, Ian Lawson and Simon Lewis spent several weeks in the Republic of Congo searching for peatlands. 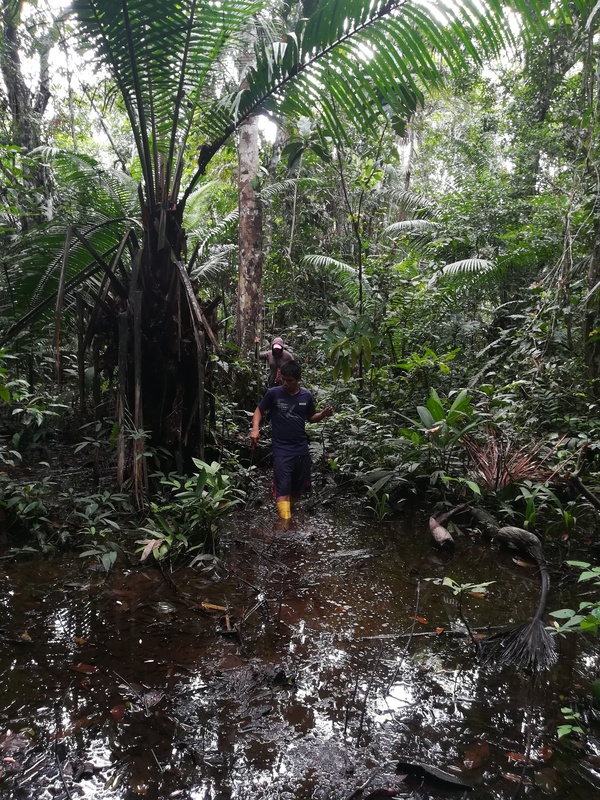 Greta’s PhD research, in collaboration with WCS Congo, aims to make the first systematic study of peatlands in the Congo Basin, developing the same kinds of themes that our group has been working on in Peru. Recent political developments mean that it is now safe, though still challenging, to work in the sparsely populated wetlands of the Congo Basin. 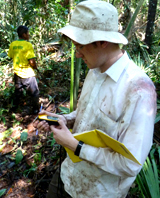 This summer saw the completion of our second round of fieldwork in the Peruvian Amazon. 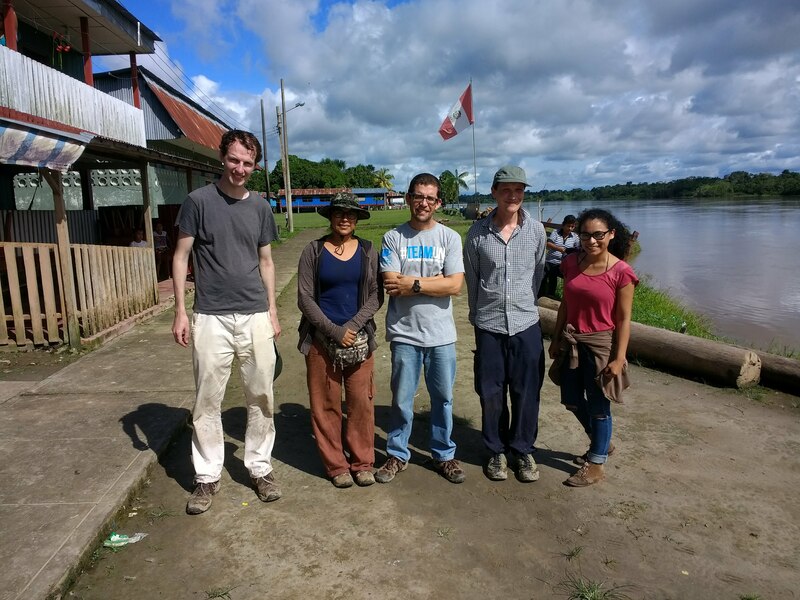 Tom Kelly, Ian Lawson and Katy Roucoux spent three weeks in Loreto, continuing their work on the peat swamp at Quistococha and surveying the wetlands around Jenaro Herrera on the Rio Ucuyali. The majority of this work will form part of Tom Kelly’s PhD research; new peat cores and lake sediment samples were collected from Quistococha and will form the basis of Tom’s study of peat initiation and vegetation succession. Tom also measured the hydrological properties of the peat and the team collected samples of modern reference pollen material. The trip culminated in a presentation at IIAP in Iquitos by Katy and Tom, which resulted in useful feedback on our preliminary pollen data from Quistococha. The team received help and support from many colleagues in Peru, not least Jhón del Aguila Pasquel, Hugo Vásquez and Julio Iriaca, who gave invaluable assistance in the field; Dr Santiago Rivas Panduro and Victor Reategui, who took the time to show us some of the archaeological and zoological highlights at Quistococha; and Dr Luis Campos-Baca, Ricardo Farroñay and Dr Ángel Salazar Vega, who provided much support and hospitality at IIAP. Graeme Swindles, Ed Turner and Chris Williams also undertook fieldwork at Aucayacu on the Rio Marañon in July as part of Graeme and Katy’s Royal Society-funded pilot study of the testate amoeba fauna.